This article is excerpted from No Contract, No Peace: A Legal Guide to Contract Campaigns, Strikes, and Lockouts by Robert M. Schwartz, which includes citations to decisions and case law. Rank and filers are often asked to join the union negotiating team. The entire membership can be encouraged to attend bargaining sessions. Meetings, handbills, newsletters, emails, direct mail, and Internet postings keep everyone informed. The union can reject bargaining ground rules that limit member involvement—for example, a rule that negotiations be kept secret. Because ground rules are not “mandatory” subjects of bargaining, an employer cannot make a particular procedure a condition for taking part in negotiations. As bargaining proceeds, the union engages in a variety of pressure tactics such as buttons, shirts, solidarity days, rallies, and marches. Informational picketing may be conducted before and after shifts. Work-to-rule and boycott campaigns may also be instituted. Every member should be encouraged to participate. The 2009 campaign by Communications Workers Local 1298 is a good example. The campaign featured rallies, stickers, television ads, T-shirt messages at football games and American Idol tryouts, red shirts on Tuesdays and Thursdays, balloons, bags of nuts with signs saying “AT&T is Offering Us Peanuts,” bubble gum fliers reading “AT&T Proposals Blow,” and “Shake, Rattle and Roll” days where employees put pennies in empty bottles, stood at their desks, and shook the bottles. Contract campaign activities help lay the groundwork for a strike by training workers in active techniques, building communications networks, and publicizing the dispute to the media and the community. Buttons, stickers, and shirts. Workers have a firm legal right to use buttons, shirts, hats, and armbands to express their opinions on the job. Typical slogans: “No contract, no peace,” “Fight for a fair contract,” “No give-backs,” “Stop union busting.” A solidarity day—everyone wearing black or red union T-shirts—is protected by the NLRA unless it conflicts with an enforced dress code. An employer can bar insignia that is vulgar, obscene, encourages violence, disparages products, affects concentration, or harms relations with customers. But speculation is not enough: the employer must have tangible evidence that the insignia is having or will have the claimed effect. In some circumstances, an employer can ban all forms of insignia (other than small or unobtrusive pins and buttons). The NLRB recognizes this exception in direct patient care areas and when a consistently enforced business plan mandates a particular public image, such as a neatly uniformed delivery driver. Even in such cases, however, a ban on insignia is illegal if the employer discriminates. For example, a delivery company could not order a uniformed driver to remove a “Contract now!” button if it previously allowed political, religious, or social-cause insignia. Nor may an employer issue a rule that is overly broad; for example, a hospital rule banning insignia throughout the institution. Ordering an employee to remove protected union insignia is an unfair labor practice. Issuing discipline because an employee refuses an instruction to remove such insignia is also illegal. Handbills. Under NLRA rules, employees must be permitted to distribute union literature to other employees or the public in nonworking areas during nonworking time, unless the employer can demonstrate that prohibiting such activity is necessary to maintain productivity or to avoid undue disruption. Nonworking time includes before and after work and breaks. Nonworking areas generally include parking lots, front steps, break rooms, and cafeterias. Company policies that forbid lawful handbilling or require prior permission are unlawful. Union flyers can express outrage and urge employees to stand together. Management may not order employees to stop, impose penalties, or call the police. Nor may it film the activity or record names. Off-duty employees may place flyers on tables in cafeterias or break rooms and on automobile windshields in the company parking lot. Management may not remove the materials. Absent special circumstances, off-duty employees must be permitted to hand out flyers to customers, clients, and the general public while on nonwork areas such as driveways and entrances. Flyers can ask patrons to tell the employer to bargain a fair contract. They can also ask patrons to take their business elsewhere. Management may not retaliate in any way. Rallies. Daily or weekly mass rallies are standard fare in contract campaigns. Although the usual location is a public street or sidewalk, employees have a right to peacefully assemble on outside areas of the employer’s premises, such as parking lots or walkways. As long as rallies do not disrupt operations or traffic, management cannot film or write down names. Informational picketing. Informational picketing (not part of a strike) adds force to a contract campaign. The NLRA protects the activity unless the contract has a no-picketing clause. Typical signs: “Fighting for a fair contract,” “Honk if you’re with us.” Bullhorns, drums, and banners can enliven the activity. Family members can join. In the absence of violence or blocking, the employer may not film or take photographs. Work-to-rule. In a “work-to-rule” action, employees scrupulously follow company policies, procedures, and standards, especially directives dealing with safety and hygiene. No one volunteers for extra duties, performs off the clock, or works at more than normal speed. Everyone takes full breaks. The NLRB has not drawn a clear line between protected work-to-rule activity and an unprotected slowdown or “partial strike.” One decision, however, prohibited discipline against employees who deliberately left their personal tools at home. Workers should be instructed to carry the campaign out unobtrusively, without open defiance. Direct orders from supervisors to perform tasks should be obeyed. Stockholders and directors. Campaigns can be directed against officers, stockholders, trustees, and directors. The union can send letters, make visits, distribute flyers, and picket homes. Because the NLRA prohibits secondary picketing, the union usually cannot picket a business owned or managed by a stockholder or a director. It can, however, use flyers and large stationary banners to ask patrons to take their business elsewhere. Q. A rule in our personnel handbook prohibits employees from remaining on the property after work. Can it be enforced against a union rally in the company parking lot? A. No. A policy that effectively prohibits lawful concerted activity violates the NLRA—even if it was enacted for a legitimate reason. Employees may not be disciplined for violating an illegal rule. Nor may the employer charge an employee with insubordination for ignoring an order to comply. Q. Our contract says employees can decline overtime requests. To give our bargaining team some heft, can we tell everyone to refuse? group is considered a strike. Q. Can management bar us from wearing our uniforms during informational picketing? A. No, unless a company rule prohibits employees from wearing uniforms off duty and the rule has been consistently enforced. Q. Can management refuse to bargain until the union stops picketing, holding rallies, and carrying out other contract campaign tactics? A. No. An employer’s bargaining duty does not disappear because the union engages in concerted activities. Q. Our personnel policy says “Employees may not use the internet to make disparaging, discriminatory, or defamatory comments about the company or the employee’s superiors.” Can the company apply this rule to employees who attack the company on Facebook? A. No. Posting contract or other union-related messages on the internet is protected by the NLRA. Q. The union president told management that unless more progress was made in negotiations she would notify customers to expect a strike. The HR director responded that the company would sue her for “tortious interference.” Is the president at risk? A. No. Unions can contact customers to seek support, urge a boycott, or warn of a possible strike. A threat to sue an employee or a union for taking part in protected activity is an unfair labor practice. Q. We made a mistake in one of our leaflets describing the company’s bargaining position. Can we be disciplined for spreading falsehoods? A. No. An employee cannot be punished for distributing inaccurate literature unless the inaccuracy is deliberate or malicious. Q. The President of the company is receiving a charity award at a local restaurant. What can we do at the event? A. You can leaflet and hold stationary banners attacking the President and the company and ask persons not to go in. But you cannot picket the restaurant or disrupt the meal. Unfair labor practices. Vigorous contract campaigns often trigger employers to commit unfair labor practices—violations of the National Labor Relations Act (NLRA). Examples include restrictive rules, threats, retaliation, and surveillance. Such actions can backfire by giving the union a legal basis for calling an unfair labor practice strike, which gives strikers greater legal protection. Think of a football lineman who jumps forward in the hope of drawing the other team offside. (For more, see a href=https://www.labornotes.org/2014/10/got-unfair-labor-practices-put-em-use>Got Unfair Labor Practices? Put 'Em to Use from the November 2014 issue of Labor Notes). Working without a contract. Another union strategy to pressure the employer is to let the contract expire and stay on the job. Contract expiration cancels the no-strike clause. With the union able to walk out at any moment, a cloud of uncertainty envelopes the employer and its customers. Expiration also extinguishes the contract’s “management rights” and “zipper” clauses. This ends the employer’s ability to make unilateral changes in assignments, workloads, hours, and other day-to-day matters. Instead, the employer must give the union advance notice and bargain to impasse before taking action. If the employer carries on as before, the union will be able to file a stream of unfair-labor-practice charges—forcing the employer to delay decisions and incur legal expenses. (For more, see Working without a Contract: A Strategy Whose Time Has Come? from the February 2013 issue of Labor Notes). Lockouts. The employer may respond to an aggressive contract campaign by locking out the bargaining unit. This too can backfire. From a union perspective a lockout has several advantages over a strike. The employer will not be able to hire permanent replacements, unemployment insurance benefits are likely to be awarded, and, in certain circumstances, workers can seek back pay. (For more, see Everything You Were Afraid to Ask about Lockouts from the April 2012 issue of Labor Notes). Robert M. Schwartz is a retired labor attorney. Excerpted from No Contract, No Peace: A Legal Guide to Contract Campaigns, Strikes, and Lockouts, which includes citations to decisions and case law. 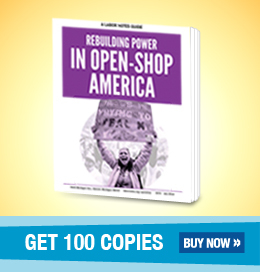 Available at labornotes.org/store. A version of this article appeared in Labor Notes #470. Don't miss an issue, subscribe today.